In the spirit of the Holidays, some developers are getting together and offering 20% discount coupons on their software. If you have been considering the purchase of Seasonality, there’s never been a better time to buy. Just use the coupon code “MACSANTA” when checking out of the Gaucho Software Store, and get 20% off the purchase of Seasonality. Thanks go out to the Rogue Amoeba crew for putting this together. Here in the Pacific Northwest, we’re prepping for a big storm that’s set to rip through tonight. Hurricane force winds are forecast on the coast, blizzard conditions are forecast for the Cascades, and it looks like we’re going to get rattled about here in Portland. Already, the winds are gusting about and hitting 40mph. I just caught wind (no pun intended) of this storm earlier this afternoon. 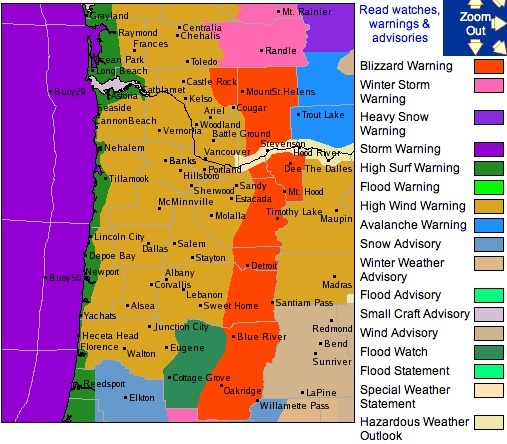 There are storm warnings covering the entire coastline of Washington and Oregon, and even part of Northern California, this is definitely going to be a big one. I even saw a High Surf Warning with estimated swell heights of 38-42 feet. If you’re in that area, hunker down and stay safe. I released Seasonality 1.4 out into the wild this morning. So far the release is going pretty nicely, without any major bugs found as of yet. I’ve been using the beta for the past few months without finding any major issues, so I kind of expected this to be a pretty stable release. The forecast server here has dished out over 700,000 forecasts up through yesterday (that’s without a final Seasonality release hitting it). I’m interested to see how long it will take to hit a million with this official release of version 1.4. Thanks go out to everyone who helped beta test this release. Also, with the risk of writing about out-of-date news, I’ve posted a couple of weather articles over on the Gaucho Software Forums. First is an explanation for the fairly quiet Atlantic hurricane season this past year. I talk about some of the ingredients needed to form a hurricane, and what has been missing this year. The second article, posted last week, explains why why relative humidity is a bad measure of moisture in the atmosphere. If you’re interested in either of those topics, be sure to check out these articles. As a side note, I am patiently waiting for the next release of YaBB Forum software, which has RSS support so users will be able to subscribe to these weather articles I post. They have a feature-lock on the release, but no word yet on an expected release date. Expectations are high when you release a piece of software for Mac OS X. Every part of the interface has to be top-notch, even the disk image which may only reside on the user’s computer for a time period of a few minutes while they install your app. At the top I have the standard Gaucho Software text and logo, complete with drop shadows where appropriate. The background has some very faint pin-striping, just to add a bit of texture and depth. It’s also a tribute to older versions of Mac OS X. Below that you see a highlighted box, which draws the user’s attention to the immediate action that needs to be performed to install Seasonality. I spent some time working on the arrow, and decided to match it’s look with the text above. Finally, at the bottom you have a couple of supporting documents. One nice thing about this DMG design is the icon spacing. It’s setup so the icons are at the default grid spacing of Mac OS X, so this will save me the trouble of lining up the icons exactly every time I create a DMG. An aspect of a DMG archive that is commonly overlooked is the disk image icon. A lot of apps use the standard disk image icon. A small subset of apps will go one step further and place their application’s icon on top of the standard disk image, to make that particular DMG stand out more. What most developers overlook is keeping the 3 dimensional aspect in check. Just pasting the application icon on top of the disk image icon will result in the app icon that does not match the 3D perspective on the disk image. To fix this, I make a couple of Skew adjustments in Photoshop, and the disk image icon below shows the completed results. This makes the icon more believable and adds that final touch.